Basic design of the filter is from RSGB VHF-UHF Manual, but I made some modifications. One must be very careful using other variable capacitors instead of my suggestions here. There is very high RF voltage on this capacitors. When I was making experiments by using two pieces of RG-58 coaxial cable 16 mm each, as a capacitors (which is about 1.6 pf), and when I applied about 8 watts RF power on 145 MHz, the coaxial cable pieces burned immediately. You can imagine how high RF voltage is present here, because maximum voltage by producer specification for RG-58 coaxial cable is more then 1,4 kV RF Voltage. This Helical Bandpass filter has very low loss. About minus 0.3 dB for the 5 MHz bandwidth and minus 3 dB for 8 MHz bandwidth. You can use it for improving the receiver front-end by reject out-of-band unwanted strong signals which can make interference and block your receiver, making incapable to receive weak signal of interest. When I connect this filter to my Baofeng UV-5R handheld transceiver, it has improve receiver ability for weak signals in 2 m band dramatically!!! Almost all wide frequency range transceivers suffers from low dynamic range in the receiver front-end. That is because it is almost impossible to made a good RF tracking filter in the front end of the receiver, for reasonable price. 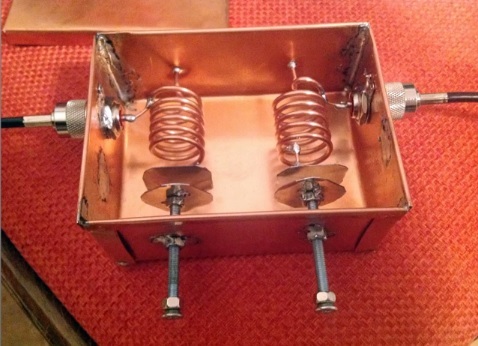 Using this bandpass filter for those transceivers/receivers make huge improvement for receiving weak signals, especially in urban area with many strong RF signals. The signal loss is only 0.3 dB. In other words, when I tested this filter on 145 MHz, and applied 10W RF power from my transmitter through filter to dipole antenna, the signal loss was only 0.7 W. It means that 9.3 W goes to antenna. (7% signal loss). On the receiving mode I can not noticed any signal changes with or without this filter even with the very weak signals, almost buried in the noise.